Rice in Cambodia is produced, mostly, during the wet season but dry season harvests are becoming more common too. The majority of Cambodians will practice traditional farming methods, when it comes to rice cultivation and this very often include the use of oxen pulling a plough and harrow. Farming the rice fields is not an easy task, and can even be nerve wracking for the first time farmer – very often, the first thought through someone’s mind is ‘are there any snakes? While there are sometimes rice paddy snakes to be found, they have a habit of leaving people alone – in fact, it is common for children to hunt them for the family dinner table! Fish are not very common in the rice fields of Cambodia anymore, which is a shame because they were once an essential part of the diet as well as being good for the local economy. There is work underway, however, to clean up the water (which is fine for snakes and rice) and reintroduce fisheries to the rice fields. Local wildlife aside, better fertilisers have meant that rice yields have increased year on year, which can only be a good thing for everybody involved. We were delighted to learn that we would be allowed to help in the rice fields, which you can see our photos here. Always dress for the occasion – a Cambodian rice field is quite muddy! One thing that we did somehow manage to forget is that rice fields are flooded – and there we stood, with water up our legs, in our best pants! Next time, we must remember to wear something more appropriate, like shorts. As it was, rather than risk ruining our pants completely, we decided to roll up the legs – it felt much better having just the water around our skin, than our pants sticking to us! It is hard work, farming a rice field, but it is something that the whole family helps with – including the children. Afterward we all took a bath in lake Srah Srang; it was a good job too, because we think we ended up with more mud on us than anybody else. The children took the opportunity of the bath to also brush their teeth in the lake, making sure that their teeth stayed sparkling clean – which they had no problem showing off with all of the fun and laughter that went with bath time in the lake! Rice fields here in Cambodia are beautiful to look at, as is the rest of the country, because the whole area seems awash with the brightest green vegetation, it is hard to imagine a more stunningly gorgeous country than Cambodia. This beauty does have a purpose though, and after spending so much time so deeply immersed in this culture, we have a much greater understanding now of how much effort, and physical hard work it is just to put some rice on a plate. Rice is incredibly important here, a fact perfectly illustrated by the fact that much more is imported than is exported. 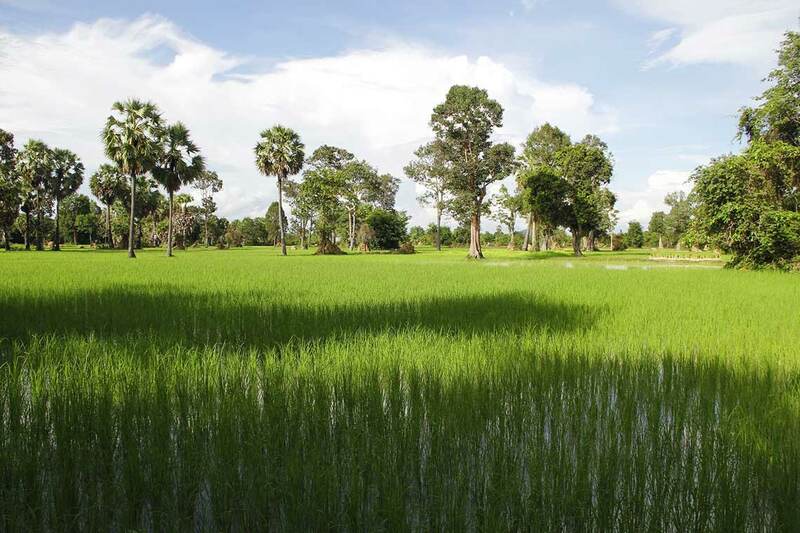 Although this disparity is being addressed, since Cambodia has an abundance of land perfect for the cultivation of rice. During the 1980’s there were over 750 varieties of rice being grown here. But after this dropped dramatically the seed bank was refilled, at least in part, and crop yield has never been better. Still, nothing can be taken for granted here, and it is an amazingly humbling experience. But such a joy too because of the opportunity of living among the Cambodian people – some of the nicest, most amazing people in the world! If you ever get the opportunity to come here, I strongly recommend that you do! Next ArticleEating Cambodian pancakes… The right way! Inga, you are giving me the Wanderlust with your wonderful photos! The pure joy in those kids’s faces – well captured. What a beautiful corner of the earth!